While the DJ on the Salesforce float thumped music and blasted bubbles, and Amazon’s employees, dressed in shirts that said “Glamazon,” danced beneath a rainbow-colored mockup of an Alexa smart speaker, a much quieter trolley waited for its turn to enter the parade. Amid all the noise sat 59-year-old Norman Tanner, calmly holding a sign that said, “I am proud to be me,” scribbled with a blue Sharpie. Tanner was among the hundreds of thousands of people, proud to be themselves, who poured onto Market Street on Sunday for the Pride Parade. 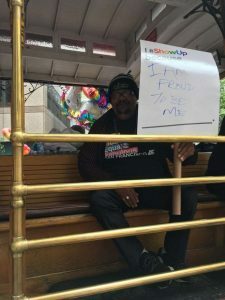 In sharp contrast to the partying, politics and countless tech companies that used the parade as a way to gather positive attention, the quiet San Francisco AIDS Foundation trolley carried people like Tanner: a gentle man who was given six months to live in 1990 after being diagnosed with HIV.